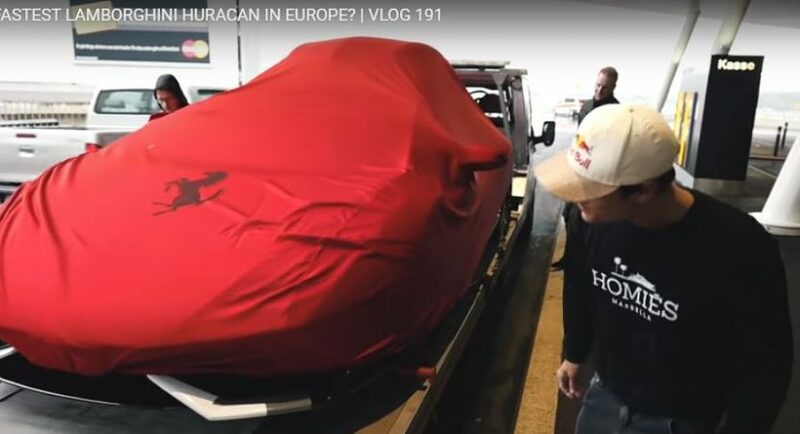 Jon Ollson, the famous alpine ski racer, has a thing with customized powerful sports cars and supercars and his latest ride that needed a special attention from the media is a custom-built Lamborghini Huracan LP 610-4. We are looking here at a heavily customized Huracan with a standout wide body kit and sheer performance under the hood. The supercar is showcased in the video below wearing carbon fiber aero styling bits, visible on the air intakes or engine cover. The model has also received a new suspension system courtesy of K&W which lowers the car`s ride height for improved aerodynamics and stability. The model is also really eye-catching with the carbon fiber rood box from 56Nord tuner which looks smashing on the car`s full camo wrap courtesy of WrapZone. All these make it the “ultimate winter transporter,” as Ollson like to call it. The supercar`s main highlight is the new power kit under the hood, which makes it the fastest Huracan LP 610-4 on the Old Continent. We are looking here with some fine upgrades, starting with the high-performance Akrapovic exhaust system and the new power kit from Stertman Motorsports. This means that the 5.2-liter V10 engine is now squeezing a massive 800 horsepower and 826 Nm of torque, delivering a sprint from 100 to 200 km/h in a blasting 5.3 seconds. Also, thanks to the Akrapovic exhaust system, this camouflaged Lamborghini Huracan LP 610-4 sounds extremely aggressive while revving its engine. You can find out more exquisite details by just watching the splendid video below!